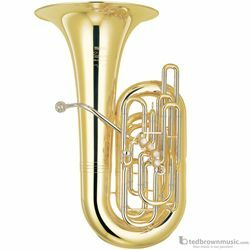 An attractive durable custom tuba features a wide bore for responsiveness and a rich warm tone. Monel pistons are resistant to corrosion and are an ideal choice for professional baritone pistons which must retain precise fit and smooth action over many years. Hand-lapping pistons is a time-consuming finishing process which results in superior valve fit for noiseless, responsive action and easy tone changes. Hand-lapping slides achieves the perfect balance between airtightness and smooth action. The rich sound of the YCB-822 is sure to come through the ensemble. The nickel-silver leadpipe helps players obtain an exquisite sound while the leadpipe's dimensions and taper offer superior intonation and response. The large bell size on the YCB-822 creates a warm sound with impressive power. All five valve slides face upward for easy access and adjustment.